FaceBook Archives | Rich TAkes! I got thrown in FB jail today, for reasons unknown. I’ve been a member since 2006. They claim I violated “Community Standards”, but of course didn’t specify the standard that I violated. I guess the community standard was not being progressive Marxist enough. My thought crime? And don’t kid yourself, that is exactly what this is. 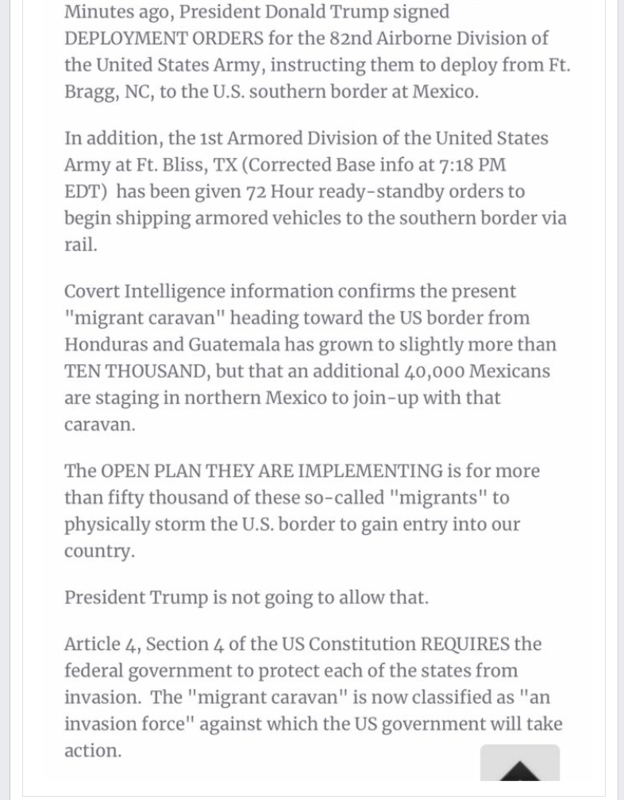 I posted a pic that somebody made stating that President Trump has called up the 82nd Airborne, America’s Division in WWII to deal with the “Caravan” of invaders coming up from central America through Mexico. I have no doubt that Trump has put all of our Armed Services on alert, including the 82nd. The pic also included the 18 Section of the Immigration and Nationalization Act (INA) that Ted Kennedy pushed through in 1964 when Jack was President, and claimed that nothing would change. Of course he lied. There is plenty of video tape to that effect. My first sentence was that “I can’t verify any of this…” I have no doubt that some one reported me for opposing the Marxist line. We are being invaded every day, and have been since and before Reagan signed the first Amnesty Bill in 1986, and the fence (at that time) wasn’t built. He said his greatest regret was signing that bill and being screwed over by the Democrats later, by killing our border security that he thought was agreed to. It was meant to be a one time deal. It is far past time to regulate Facebook, and I am a free enterprise type of guy. I am also a free speech advocate, and they are over-stepping here with their community standards (which no one can seem to define). They just make it up as it suits them.